So if you’re looking for some pizza that’s not from Pizzeria Toro or Pompieri, you’ve now got another option. 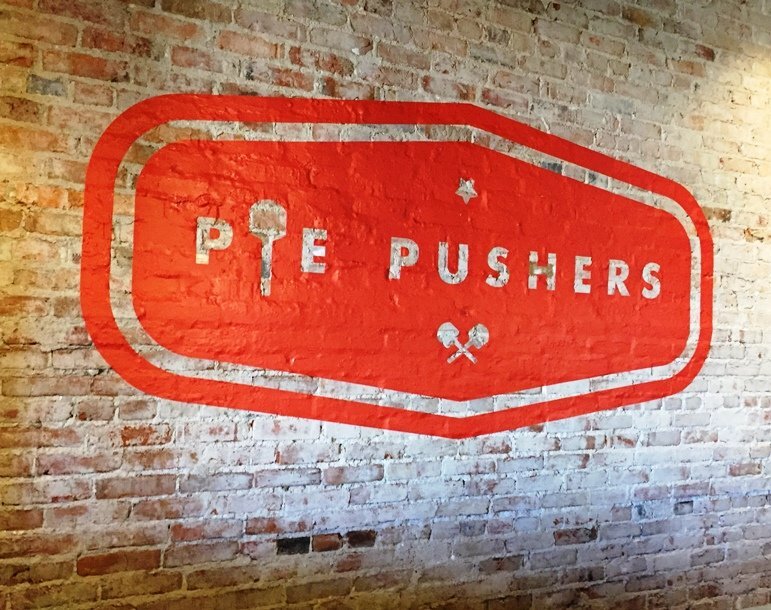 Located above the Pinhook Bar in a slate grey building with red trim, you’ll see Pie Pushers’ neon sign overhead. Up the stairs and you end up in a tidy little space with cool touches all around including a light bulb “PIZZA” sign on the climb up. 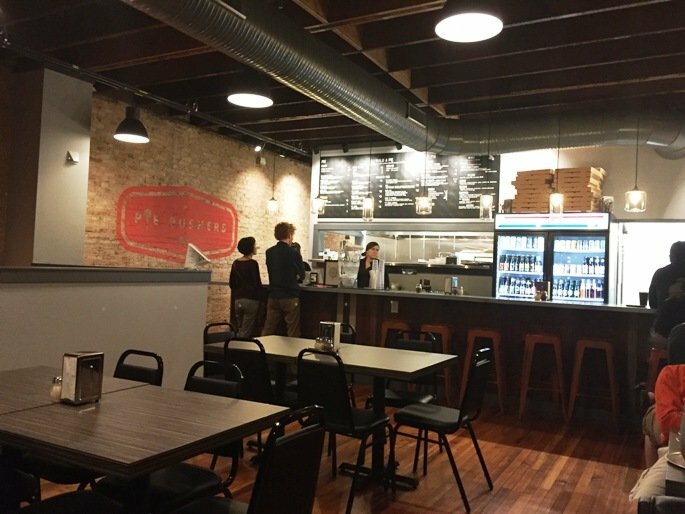 Pie Pushers space feels like a modern, urban pizzeria with faux wood formica tables and the requisite stainless steel napkin dispenser with cheese and pepper shakers perched on top. Seating is scattered about the space ranging from two-tops, four-tops and some stools at the bar. It all feels, warm, cozy and well put-together. 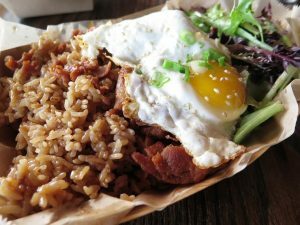 Over at the counter, I peruse the menu. It’s pretty basic with pizza by the slice (nice! ), 10 specialty pies and you can do the standard thin-crust or a Sicilian style pie. 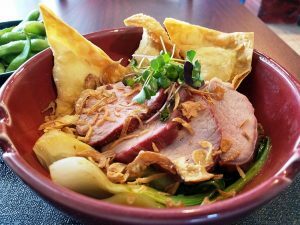 There’s also a small list of appetizers, salads and wings to add to your pizza order. 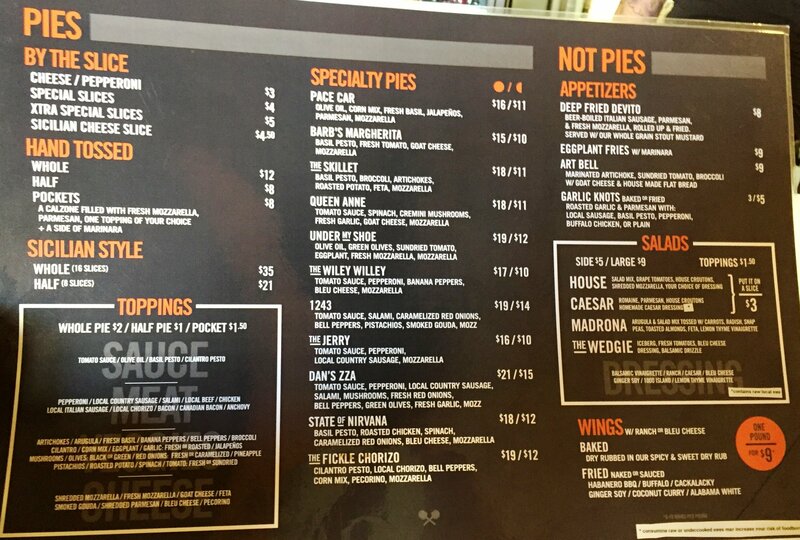 Several nice touches is that Pie Pushers allows you to order a half-pie and the base cheese pie is only $12. Quite the deal in this pricey downtown Durham neighborhood! 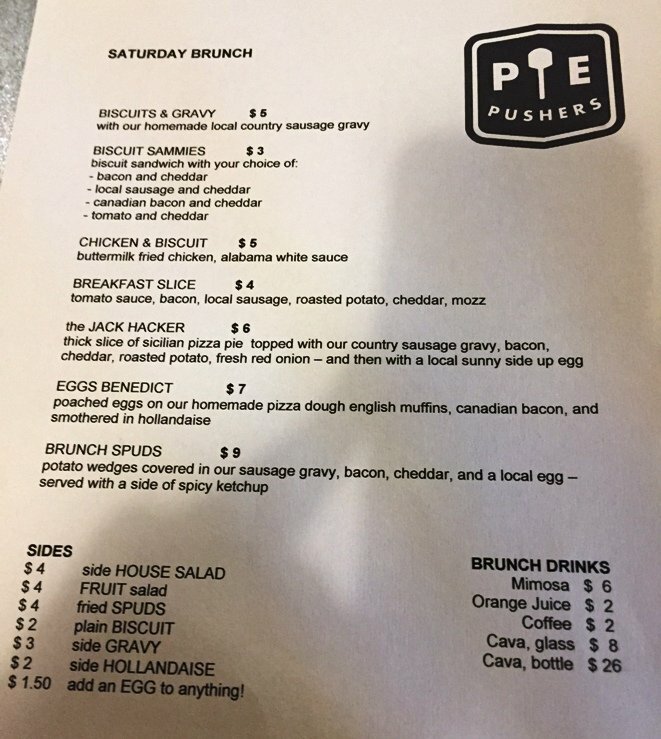 And Pie Pushers also offers several beers on tap along with a decent bottled selection to enjoy with your pizza. I order up the Jerry pie which comes with pepperoni and sausage. It takes about 15 minutes and a beautiful half-moon pizza is placed in front of me. I dive in but of course check the crust first, taking a peak underneath. It’s slightly speckled with a black char, great job done here in the oven! 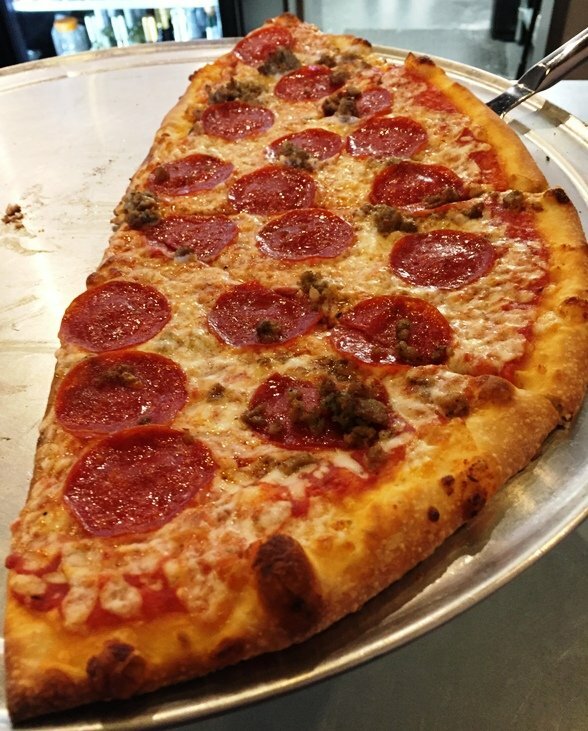 Pie Pushers pizza is best classified as NY thin-crust and it’s quite good. Tender crust that still has some structural stiffness to carry all the toppings. There’s a good smattering of meat and the cheese-sauce coverage goes nicely to the edge. Pie Pushers pies are about 15″ or so in diameter, the half-pie is plenty to eat for one person!